Volunteers from Wicklow-based mountain rescue teams speaking to An Garda Síochána. Credit: DWMRT / Facebook. Emergency services across Wicklow teamed up to find and airlift a missing Bray man yesterday at Kindlestown Woods. Dublin & Wicklow Mountain Rescue Team (DWMRT) say the rescue was of a vulnerable missing person, believed to have been outside overnight. The missing Bray local’s phone was tracked by An Garda Síochána to an area between Bray and Greystones according to his granddaughter. An Garda Síochána contacted DWMRT and Glen of Imaal Red Cross Mountain Rescue Team to join the search at 13:46. 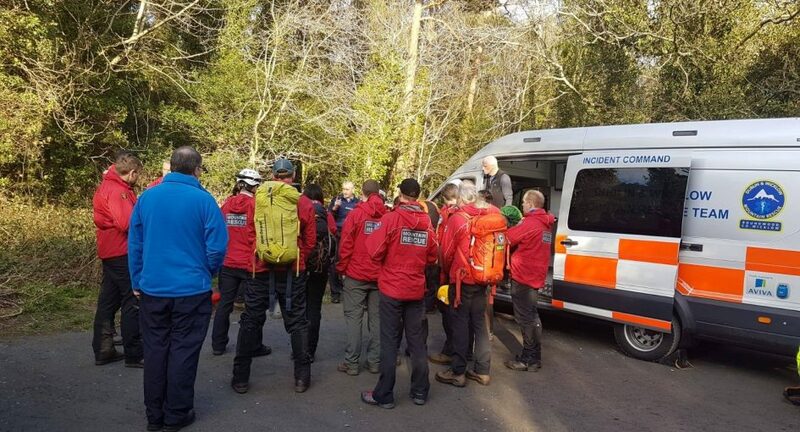 “Mountain rescue personnel created a search plan and searched the forestry and adjacent land,” write DWMRT. The volunteers were successful in their search – finding, assessing, and treating the missing man. He was then airlifted by Irish Coast Guard helicopter Rescue 116 before being transferred to hospital. “Everyone involved in the operation was very happy that the search had a good outcome. We were delighted to be able to help reunite the missing person and their family,” said John Kavanagh, a spokesperson for DWMRT. Dublin & Wicklow Mountain Rescue Team are currently fundraising to build a permanent rescue base to support their rescue operations. The group is hosting a charity event called Walk The Line on Saturday, March 30th. “This event, however, cannot be successful without your support. We understand there are so many charities looking to raise vital funds for the good causes they provide, making fund-raising a more difficult task all round. By you taking part in Walk the Line you will be helping us to ‘Save Lives in Wild and Remote Places’.